"Arrival!" A comet crashes to earth, and out of it emerges Rom, greatest of the Spaceknights. A car approaches, and the shocked driver, Brandy Clark, loses control. Rom saves her from going over a cliff. Then he summons his energy analyzer and scans her, after which he flies off. In the nearby town of Clariton, Rom scans the residents with his analyzer, and then summons his neutralizer and turns two of them to ash. As people flee in fear, Rom notices Brandy again, and this time he flies off with her. Using his translator, he tells his origin story: his people were at war with the Dire Wraiths, and he and others volunteered to give up half their humanity to become cyborgs. The Spaceknights won a victory, but the shape-shifting wraiths fled to various worlds. Rom has come to earth to hunt them down. Brandy isn't sure she believes him, but then the national guard shows up, and attacks. Rom battles them. Among them are several wraiths, who try to kill him and capture Brandy, but Rom uses his neutralizer to send them to Limbo. Then he flies off, leaving Brandy to wonder what is really going on. Story - 4/5: This is the inaugural issue of one of the top comic-book series of the Bronze Age of comics. Writer Bill Mantlo heads an all-star cast of creators on this book, the credits of which read like a who's-who of Bronze Age talent. Mantlo introduces us to the character of Rom, who is based, surprisingly enough, on a Parker Brothers toy of the same name. Even in those days, basing a comic-book on a toy could easily relegate it to exclusively young, unsophisticated audiences, but Marvel Comics clearly, at the time, believed they had more of a winner here than that, based on the top talent they assigned to the book. And the strategy clearly worked, because unlike many first issues, which can be rocky, this one is solid from start to finish. Mantlo spins a tightly woven, gripping tale of suspense and science fiction, keeping the reader turning pages to see what will happen next. In the classic Bronze Age style, the tale is told to the audience by an omniscient third-person narrator, and here Mantlo truly shines as perhaps the greatest caption writer in the history of comics. He combines over-the-top (yet highly enjoyable) narrative hyperbole ("The comet appeared out of nowhere... if it was a comet!" "Tomorrow someone... will investigate... if there is a tomorrow!") with evocative, almost novel-esque descriptive passages ("To his left he notes the gentle mountains, worn down by the ages.") This narrative style was attempted by countless writers before and after Mantlo, but no one pulled it off as well as he. Bill Mantlo shows in this issue, as he will consistently for the next four years, that when it comes to writing comic-books, he is the master. The story itself moves in three acts, as most solidly written fiction does. Mantlo opens with Act One, which introduces the primary players - Rom, the Spaceknight, and Brandy Clark, the West Virginia woman who happens across him. Rom scares her into driving off the road, and, although he doesn't know much about earth yet, he intuits that this accident is his fault. And so he grabs her car as it careens past him, and pulls it to safety. He then turns his energy analyzer on Brandy, which might make the reader think he will kill her, but it does no harm, and he flies away. Thus we see right away that Rom does not intend any harm (at least so it seems), and Brandy, although shaken, becomes curious about him and why he spared her. Rom next enters Clairton, W.V., the small town that will figure prominently in upcoming issues, and turns his analyzer on the crowd. Then he pulls his neutralizer and turns two of the people to ashes. Brandy, having driven into town at this point, is frightened by this, but when everyone else flees, she does not, because she knows the visitor saved her life. Rom takes her and flies into the woods to talk. This is the end of the first act. In the second act, we see the history of Rom and the Spaceknights. This sequence once again stands as a testament to Mantlo's sheer science fiction genius. He came up with a powerful and moving story that also laid the seeds for sixty-five issues worth of Rom stories. Here we learn that Rom is from the advanced, peaceful world of Galador. The Galadorians went exploring and blundered into the Dire Wraiths, who are evil. The wraiths attacked and defeated Galador's fleet and then moved on the world itself, planning to conquer it. The Prime Director asked the youth of Galador to give their humanity to become cyborgs, a last desperate line of defense. 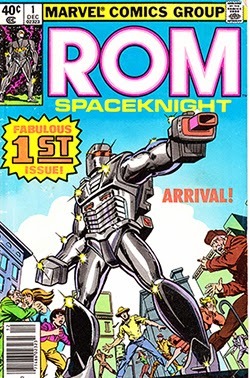 Rom, whose name means "first," volunteered, and then others, until an army of Spaceknights was formed. Together, they defeated the wraiths, and scattered them. Not willing to leave other worlds to the depredations of the Dire Wraiths, the Spaceknights are now hunting them throughout the galaxy. This section of the story is engaging and fun to read. The Wraiths make excellent and creepy villains. Their shape-shifting ability clearly will make them difficult to defeat, because they can hide among us and we have no way of knowing it. And the poignancy of the Galadorian youth's sacrifice, giving half their humanity to save their people, is moving. Mantlo accomplishes all this in a mere five pages, and it has stood ever since as one of my favorite origin stories in all of comics. In the final act, the national guard shows up and attacks Rom. They cannot really harm him, and he fights them while trying not to harm humans, because he is not here to fight us -- he is here to save us from the Wraiths. The Wraiths, however, are shape-shifters, and have infiltrated our world for years. A few are in the army, and they pull disruptor guns on him to try and kill him. Brandy shouts a warning, which allows Rom to defend himself. He uses his neutralizer, which we now know does not kill, but sends the Wraiths to the plane of Limbo, leaving ashes behind as a by-product of the transportation. Rom dispatches the Wraiths, and then flies off, leaving Brandy Clark to wonder who this strange robot-like man is, and why he has spared her twice now. Mantlo does a fantastic job in both telling a complete, self-contained, and satisfying story, and setting up the future. Here in this first issue, we see many elements that will recur in the future, such as the special relationship between Brandy Clark and Rom, and the sinister, manipulative power of the shape-shifting wraiths. Rom uses all three of his tech devices -- the Energy Analyzer, the Neutralizer, and the Translator. And we see a glimpse of Clairton, which will figure so prominently in the next 49 issues of the series. Overall, this is an exceptionally good story, well worth a read by anyone who enjoys a good tale. It has stood the test of time and continues to read well. Bill Mantlo's narrative style, his dialogue, his pacing, and his plotting, all tower above the puny comic-book writing "talents" of today. Indeed, judged against the standards of other comic-books, especially modern ones, this book warrants a 5 rating. The only reason I give it a 4 is that, compared to the Rom stories I know are coming (such as the two Hybrid story arcs, and the Galador story arc), this one is not quite as strong. Yes, that means Mantlo's work is going to get even better, which might be hard to believe if this is the only Rom issue you've ever tried. But I had to leave some room at the top of the ratings for those issues, or else I'd just end up giving almost every issue in the series a 5/5. Artwork - 4/5: Sal Buscema was perhaps the greatest artist of the bronze age. In this issue, we can see his style anticipating much of the work that would come in future years, especially in the 1980s, which were just around the corner (Rom #1 was published in August of 1979, as is attested by the ads for the "upcoming" fall cartoon line-up in its pages). In particular, his layouts are extremely modern, such as on the very first page, which, although it is a splash page, has some very modern-looking "inset" panels. Additionally, Buscema is a master at kinetic-looking action poses. Whether in flight, or dispatching Wraiths, or being blasted by a Wraith energy beam, Rom always looks like he is in motion. And the classical science-fiction elements of the flashback sequence are simply priceless. Here again, as with the story, if this issue were being measured against any other series, I would give the art full marks. However, again, I know what's coming, and how much better the art will become when first Joe Sinnott and then Ian Akin and Brian Garvey, take over the inking chores, and I had to leave some room at the top to score those issues. Cover - 3/4: The cover, done by Frank Miller, is probably the weakest part of this issue. I think the basic poses on the characters, both Rom and the background people, are quite good, and I like the basic layout. However, Miller clearly was just drawing Rom with the toy in front of him, and either didn't have access to the interior artwork or did not care to reference it. Rom's hands, waist, backpack, and boots all contain mistakes -- none of them appear the way they do on the inside. I will say, however, that Miller did a better job with Rom's "pen light" eyes, and anticipates the stylized glow that Buscema will adopt in a later issues. Overall, however, compared with upcoming covers by Michael Golden, Al Milgrom, or Buscema himself, this cover is just average. Overall Experience - 4/5: Taken together, the combined experience of this comic is superlative. If I were comparing this issue against other comics, especially the garbage that passes for "quality" comic-book fare today, I would absolutely give it a perfect score. It's just that much better than almost everything else (only Walt Simonson's Thor, George Perez's Wonder Woman, and Kurt Busiek's Astro City are in the same category). However, once again, comparing this issue against other issues of Rom, I know that there is better yet to come, and I have to leave that 5/5 score for the very best issues of this series. Still, I can't say enough good things about this comic. These days one reads lots of "first" issues, because companies renumber their comics just to sell more copies. But the first-issue stories of today are nothing like Rom #1; today's comics lack the pacing, the content, the style, and most importantly the quality of this story. Both Mantlo and Buscema were, independently, brilliant comic-book creators. But when Marvel put them together, we were treated to true comic-book genius. You won't find a better first issue anywhere than Rom #1.